Yesterday the hosannas ceased as Christ's passion began. We enter Holy Week, following in the way of Jesus, whose very body will be betrayed, beaten, and broken by us and for us. This is not the first time God has journeyed with God's people from death to life. The Passover in Exodus reminds us of this well-worn path. God passed over the people living-to-die in Egypt so they might experience dying-into-life in the promised land. On this "day of remembrance," God's people are re-membered to the divine promises of life--a re-memberment that takes place in our very bodies. This Holy Week is a full-on body journey as we accompany Jesus, God's own embodiment, from life to death to life resurrected. Each day our bodily senses will be awoken and animated as we experience the passion that takes us to the cross and beyond. Along the way, we too are re-membered to the body of one who leads us out of death to life evermore. Enliven our senses, O God, to your presence at work in our bodies. As we enter again into the story of your passionate love for us, hold us close, body to body. Amen. [5 Your lamb shall be without blemish, a year-old male; you may take it from the sheep or from the goats. 12 For I will pass through the land of Egypt that night, and I will strike down every firstborn in the land of Egypt, both human beings and animals; on all the gods of Egypt I will execute judgments: I am the Lord. 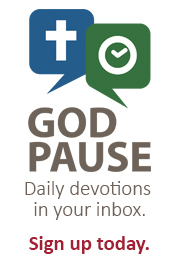 For the season of Lent and concluding on Easter Sunday, God Pause devotions comprise the Lenten devotional booklet published by Luther Seminary for individual or congregational use. Download the booklet at luthersem.edu/lent/.